"'You reap what you sow!' Still standing, and still smiling, Frosty certainly had the last laugh!" (CBS NEWS) -- A couple in Petersburg, Kentucky, built a 9-foot snowman together, only to realize the giant spectacle had attracted vandals. 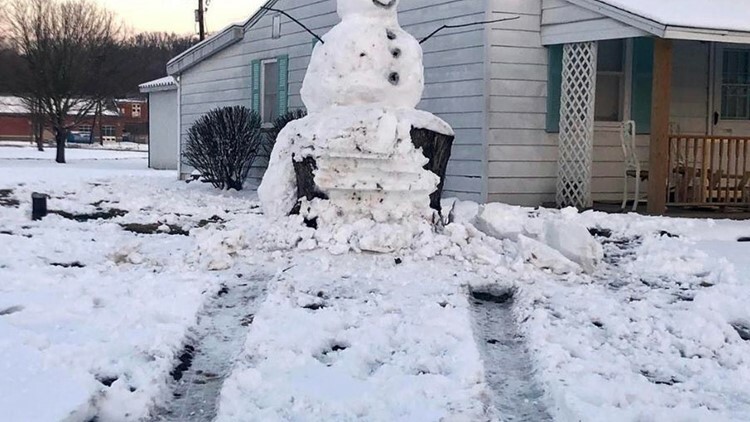 Their work of art could not be destroyed, though, and the vandals received a dose of karma for trying to plow into the snowman with their car. Cody Lutz said his fiance was visiting him in Kentucky and was excited to experience the biggest snowfall she's ever seen. His soon-to-be-wife, Laura, is from Mississippi, so when snow fell during her weekend trip, the couple celebrated. "We had a full weekend of sledding, snowball fights ... and making the most of the winter wonderland," Lutz told CBS News via email. "Of course, that included building a snowman!" This is Petersburg for you. What they didn't count on, is the massive stump in the center. Life is hard, but it's much harder when you're stupid. The couple used a massive tree stump in the front yard as a base for the towering snowman. When they finished making him, he was nearly 10 feet tall and had a massive top hat. It was hard to miss their masterpiece. Lutz realized someone tried to drive into their snowman, but since the base of it was a stump, the would-be vandals failed — miserably. "The massive stump is now exposed, with a snowy imprint of a bumper stuck to it!" Lutz said. "Apparently Frosty had been handing out life lessons to some very-surprised 4x4 vandals," he joked. "'You reap what you sow!' Still standing, and still smiling, Frosty certainly had the last laugh!"